Find places to stay in Fremont, CA and other fun things to do. View our list of attractions, activities, events, restaurants and visitor information. Currently as low as $105.99/night! Set on three landscaped acres the Best Western Plus Garden Court Inn offers free parking internet access and continental breakfast just off I-880. The three-story Best Western has 125 rooms with free internet access cable TV microwave mini-fridge and coffeemaker. Free Internet, Swimming Pool,Outdoor Pool, Free Breakfast, Pets Allowed, Non Smoking Rooms. 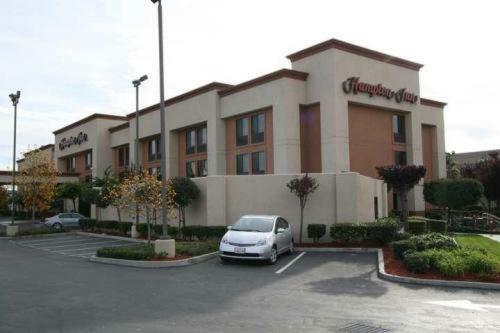 Excellent freeway access Wi-Fi free hot breakfast an outdoor pool and rooms with microwaves and mini-fridges are just some of the amenities our guests enjoy at the Comfort Inn Silicon Valley East. Free Internet,Outdoor Pool, Non Smoking Rooms. Amenities like free Wi-Fi on-site dining an indoor pool and a landscaped patio make the non-smoking Courtyard by Marriott Fremont a highly rated choice of our guests staying in Silicon Valley. Free Internet, Swimming Pool, Indoor Pool, Restaurant, Non Smoking Rooms. Boasting free Wi-Fi continental breakfast and rooms with microwaves and mini-fridges the Days Inn Fremont also offers a quiet location with easy highway access. Free Internet, Free Breakfast, Non Smoking Rooms. Double Delight is located in Fremont. The air-conditioned accommodation is 39 km from San Francisco.The holiday home includes 2 bedrooms a living room and a bathroom with free toiletries. There is a dining area and a kitchen complete with an oven and a microwave. Free Internet, Non Smoking Rooms. Studio suites with full kitchens and free Wi-Fi along with added-value amenities like a guest laundry and a fitness room please our guests at the pet-friendly Extended Stay America - Fremont - Newark. Free Internet, Free Breakfast, Pets Allowed, Non Smoking Rooms. Rooms with full kitchens and Wi-Fi an on-site laundry and a pet-friendly policy make Extended Stay America - Fremont - Warm Springs a good choice for our guests looking for the comforts of home. Free Internet, Free Breakfast, Pets Allowed, Non Smoking Rooms. With extended-stay amenities like all-suite accommodations with full kitchens and a location close to freeways public transit and shopping the pet-friendly Homestead Fremont-Fremont Blvd. South has what it takes to please our guests. Free Internet, Free Breakfast, Pets Allowed, Non Smoking Rooms. Free Internet, Swimming Pool, Indoor Pool, Free Breakfast, Restaurant, Non Smoking Rooms. The Good Nite Inn Fremont provides free parking and breakfast as well as an outdoor pool and hot tub. The Spanish-style Good Nite Inn has three levels of exterior-entry rooms. The 120 basic rooms include free daily breakfast and offer cable TV and available Wi-Fi. Free Internet,Outdoor Pool, Non Smoking Rooms. Amenities like a free hot breakfast high-speed internet access an outdoor pool a fitness center and rooms with microwaves and mini-fridges plus an easy-access freeway location draw our guests to the non-smoking Hampton Inn Fremont. Free Internet, Swimming Pool,Outdoor Pool, Non Smoking Rooms. Welcome freebies like a hot breakfast an evening reception Wi-Fi combine with an outdoor pool a fitness center and a convenient freeway location to make the non-smoking Holiday Inn Express Fremont a sure bet for our guests. Free Internet,Outdoor Pool, Free Breakfast, Non Smoking Rooms. Currently as low as $102.34/night! Amenities like on-site dining complimentary breakfast and Wi-Fi plus an outdoor pool are some of the many reasons our guests choose the non-smoking Hyatt Place Fremont/Silicon Valley. Free Internet, Swimming Pool,Outdoor Pool, Free Breakfast, Restaurant, Pets Allowed, Non Smoking Rooms. Complimentary Wi-Fi an outdoor pool free breakfast and an easy-access highway location are amenities that get approval from our guests at the pet-friendly La Quinta Inn & Suites Fremont/Silicon Valley. Free Internet, Swimming Pool,Outdoor Pool, Free Breakfast, Pets Allowed, Non Smoking Rooms. Low rates an outdoor pool and ready freeway access make Motel 6 Fremont North a convenient option for budget-conscious East Bay travelers. This low-rise Motel 6 Fremont North offers 212 rooms decked out in bold colors. Rooms offer cable TV and Wi-Fi for an extra fee.Outdoor Pool, Pets Allowed, Non Smoking Rooms. This Fremont motel is 20 minutes' drive to California's Great America and 1 hours' drive to San Francisco. Free Wi-Fi is included in all guest rooms.A cable TV with premium channels is included in each air-conditioned room at Motel 6 Fremont South. Free Internet, Pets Allowed, Non Smoking Rooms. Featuring hot breakfast an outdoor pool a fitness center and all-suite accommodations with full kitchens the non-smoking pet-friendly Residence Inn Fremont has the extended-stay amenities that our guests are looking for. Free Internet, Swimming Pool,Outdoor Pool, Pets Allowed, Non Smoking Rooms.